Olentangy’s Sean Marks shoots a contested jumper over Westerville North’s Julius Brown (1) and Tyrell Collier (2) during the first half of Friday’s OCC showdown in Lewis Center. 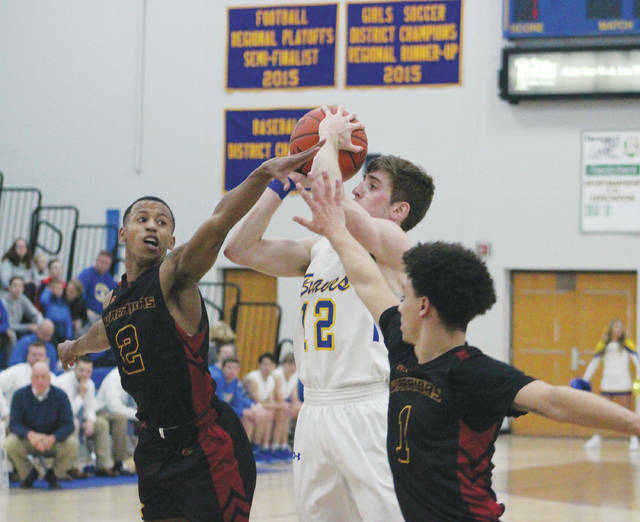 The Westerville North boys basketball team used a 24-4 run in the second half to come back from a nine-point deficit and take control en route to a 69-56 OCC win over host Olentangy Friday night in Lewis Center. Braves coach John Feasel seemed to be writing a song after the game, going back to the familiar refrain, “We’ve gotta makes shots” at several points during his postgame comments. While this game surely won’t be on his Greatest Hits album, it might be more fondly remembered by North’s Jeremiah Keene, Julius Brown and Phillip Alston as the trio combined for 50 points. Keene hit two threes sandwiched around a J.J. Harvey three-pointer in a four-possession span that gave North (4-0, 2-0) control in the fourth quarter. Meanwhile, Olentangy had trouble finding points. Sean Marks was held to four points in the second half after scoring 15 in the first half, including five during a 10-0 run to give Olentangy a 37-33 lead at the break. Alex Sieve, who finished with 12 points, scored five points as Olentangy started the second half 7-2 for its largest lead of the game at 44-35 midway through the third quarter. That’s when North made its move. Keene started the rally with a three-pointer and Harvey knocked down another in the final seconds of the third quarter to give North a 48-46 lead. North’s lead got as high as 15 before Marks closed the game with a steal and score. Keene had 21 points, Jeremiah Brown finished with 16 and Alston added 13 to lead North. Jerred Kinnaird finished with 10 points for Olentangy (2-2, 0-2). Olentangy is right back at it today at 4:00 p.m., hosting Groveport-Madison in non-league action.